Certain maintenance tasks, such as asset management and inspections, are usually repetitive and dull. This work ends up being pushed aside when there are other, more immediate, maintenance jobs to be performed. However, the best way to keep equipment functioning at their optimal level is to perform inspections and by having the spare parts to perform minor maintenance issues quickly so unexpected breakdowns don’t stop production lines. This second part of MSI Data overview series features the seamless asset tracking and mobile inspection capabilities that are at your fingertips when using this software. ServicePro © with Macola 10 ERP integration eases the burden of repetitive tasks by making the work easier to manage and perform. ServicePro© provides an all-in-one management suite when you need to know what types of service parts your equipment requires, whether the parts are under contract, and if your warehouse has the spare parts available. Once your spare part inventory management is squared away, you can then have service technicians perform thorough inspections of equipment in thefacility by filling out inspection checklists on their mobile apps which can be instantly sent to the desired supervisors and other personnel. Every piece of machinery, and its components, comes with warranty contracts and service numbers that need to be traced to determine when the part was installed and which manufacturer provided the part. Yet going through numerous filing cabinets and folders to find the information is time consuming. Speed up the process with ServicePro© © field service asset tracking. Now, all the information can be placed into the ERP its available to technicians, repair workers, inspectors, supervisors, and even warehouse personnel who can order additional spare parts to keep for maintenance purposes in the future. 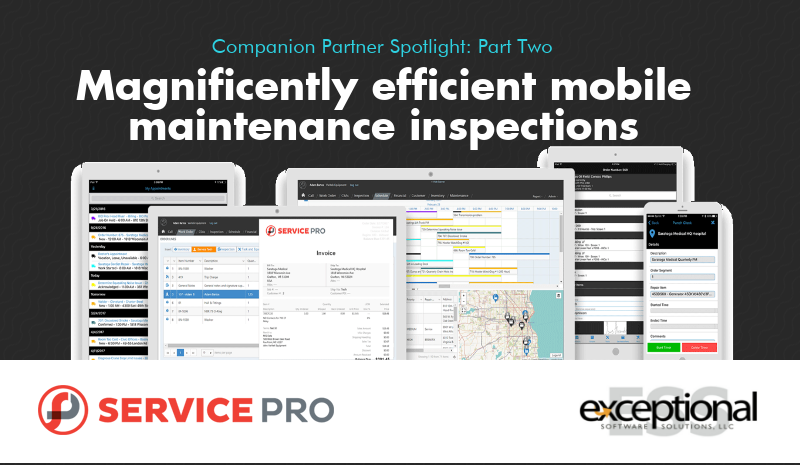 ServicePro© software connected with your Macola ERP allows the entire maintenance and field service team to see which equipment is still under service contract and contact the manufacturer if they need to send their specialized technicians to provide additional repair or upgrade work. If equipment is not meeting productivity goals, purchasers can order equipment ahead of schedule, so that the items are available when technicians perform regular maintenance. Warehouse personnel have a leg up in their purchasing work as they can better track their inventory to lower product waste and to save money. Carrying around paperwork and numerous questionnaires can be a hassle for inspectors. In addition, not every piece of equipment needs a complex inspection to be performed, as you end up having wasted documents with no information on them stacked up on your desk. ServicePro© from MSI Data makes inspections paperless with their mobile app checklists. This mobile inspection software features customizable questionnaires and checklists that can be tailored based on the type of equipment that is being evaluated. The inspector only has to type information into the available fields as this feature makes their work efficient — and faster. The software also allows the inspector to capture additional details about the conditions of the equipment by allowing them to take photos that will be included with their inspection report. Once the inspector is finished with the evaluation, they can place their signature in the mobile inspection report to sign off on the work and upload the information to the Macola ERP system. They also have the ability to create reports and send information to other personnel. All the documentation needed in one central place. Auditing, accounting and inventory management now all become much more efficient. MSI Data’s ServicePro©, when combined with your Macola ERP, gives you greater transparency regarding your maintenance, inspection and repair work schedule. You control where technicians need to be on the facility floor, know what tasks are being done, and can track your maintenance supplies. Once technicians and inspectors have completed their work, you can get your production lines up and running again at full capacity. Any hurdle that is experienced in one part of your processes will impact your entire manufacturing company. Why automate all the other departments with enterprise resource planning software but leave your maintenance and repair offices struggling to play catchup while using outdated software and manual processes? Get them up to speed with MSI Data ServicePro© for Macola ERP. Simplify your maintenance and repair processes and take one more giant leap toward becoming a digital factory.